The Colorado Avalanche and Vancouver Canucks have little room for error in the final few days of the regular season. The teams tied for the Western Conference's final two playoff spots look to improve their positioning as the Northwest Division rivals meet Wednesday night in Denver. Vancouver (38-28-10) allowed two third-period goals and fell 3-2 at division-leading Calgary on Tuesday. The loss left the Canucks tied for seventh place in the West with Colorado (40-31-6), which a night earlier beat the Flames 2-0 at home to snap a four-game losing streak. "It's tight hockey right now; it's playoff hockey, four-point games that are huge for us," said Colorado's Jordan Leopold, who scored his first goal in 2 1/2 months Monday. The meeting Wednesday will be the first of two between the teams in a span of seven days. They'll conclude the season series Tuesday in Vancouver. Colorado, looking to return to playoffs after missing out last season, has dominated the series with Vancouver this season, holding a 4-1-1 advantage and looking for a fifth consecutive win over the Canucks. The Avalanche have won two of their three home contests against Vancouver this season, including a 2-1 win on March 4 in the most recent meeting. Colorado has won six of its last seven home games and is 24-12-2 at the Pepsi Center, where it will play three of its final five. The Avalanche are 10-3-0 there versus divisional opponents. "We know that the teams behind us are pushing, and it's important we keep our position," said Colorado's Ryan Smyth, who recorded his 600th career point when he assisted on Milan Hejduk's goal Monday. "The only way we do that is taking care of our own destiny and taking matter into our own hands." Smyth has an assist in each of his last three contests. Hejduk, meanwhile, has two goals and an assist in his last two games while posting the same against Vancouver this season. Jose Theodore made 23 saves for his third shutout of the season Monday after allowing 11 goals in losing three of his previous four decisions. "These are playoff-type games. You know there's not going to be too many goals on either side," said Theodore, who is 3-0-1 with a 1.71 goals-against average versus Vancouver this season. "When they get chances you want to make sure you give your team a chance to win." Markus Naslund and Daniel Sedin each scored first-period goals Tuesday for Vancouver, which blew a 2-0 lead and dropped its second straight contest by one goal after falling 2-1 to Minnesota on Friday. 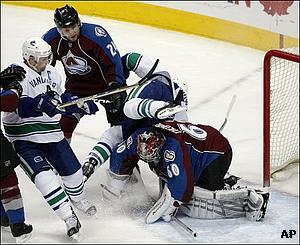 "We have our next game (Wednesday) so we have to forget this one and regroup," Vancouver's Sami Salo said. "It's another huge game." Sedin, who has two goals and four assists against Colorado this season, has two and three assists in his last four games overall. Roberto Luongo made 37 saves Tuesday, but allowed one fewer goal than he did in his previous three games. After allowing four goals in winning his first two starts against Colorado this season, Luongo has given up 12 in losing four in a row to the Avalanche.